This beautifully produced invite dropped through our letterbox this morning for an exclusive one night only event that is happening tomorrow evening. East London artist D*Face and Smirnoff have teamed up to create an inventive limited edition collectable bottle. 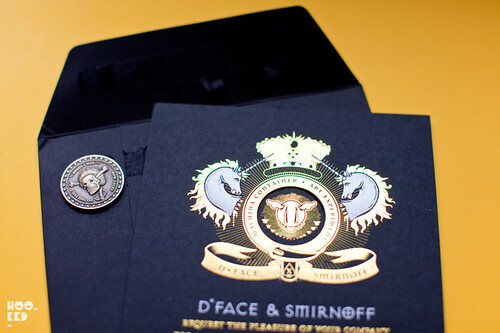 To celebrate the exciting collaboration, D*Face and Smirnoff will be hosting an exclusive party encompassing an art experiment of a surreal nature in east London on Wednesday 13th June where attendees will receive one of the bespoke pieces of D*Face art. Hookedblog are able to offer one lucky winner a pair of VIP tickets to this invite only party.For a chance to win, name the East London gallery that D*Face owns? Please leave a comment below with your answer and an email address where we can contact you. We will select one winning entry at random and notify the winner via email tomorrow morning at 11am. Good luck! The competition is now closed, thank you all for entering. The winner will be contacted via email with details of tonight's event. Stuck in the past. it's now stolenspace gallery. There seems to be a delay in cooments appearing - so don't freak out if you don't see your comment straight away. We can see them all.